I am a positive person by default and as Ethan gets older, I am realising just how much my mood, my actions and what I say can have upon him. He is really impressionable at the moment and doesn't miss a thing, so I am conscious of considering my behaviour and being a positive role model for him. So when I heard about the Unilever #BrightFuture initiative, it felt like something fun and relevant to be a part of. Their goal is to unite communities and encourage small changes in everyday life that have a positive impact on the world. According to their research, 83% of British parents felt the birth of their first child made them want to change some aspect of their life for the better. Nine out of 10 parents and 8 out of 10 children agree that if everyone does small things to improve the environment, “together we can make the world a better place”. And it may sound like quite a big claim to make, but I do think that when you become a parent, you do see the world a little differently and you know that you want to do what you can to make the right impression and lead by example. I've given some thought as to how we as a family are doing what we can to give Ethan a bright future, and what else we could do to make a difference..
* Hubs and I joined a gym a few months ago and Ethan also has membership. This was a huge thing for us as we're not as active as we could be and we have realised just what impact our own bad habits can have on Ethan as he learns about the world and creates his own patterns of behaviour. Being more active both individually and as a family too at weekends is helping us to have a happier and healthier future. * Through circumstance, Ethan has been at nursery, and now preschool, since he was eight months old and for us, it has helped us to build a bright future for Ethan. I firmly believe that the support they provide, the creative learning and the chance to socialise with children his age from all different backgrounds has really helped him to develop and become the sociable and inquisitive child that he is. * We have regular clear outs in our house, sorting through things we have and do not need, use or want any more. Ethan has been given a great deal over the years from generous friends and family and we really appreciate this, but as he grows and some things are no longer played with as much, we make regular trips to our local charity shop. It always feels good to pass things on to others who might get more use from them plus it makes things a bit lighter, brighter and less cluttered at home. * Following on from this, having a 'big clean' now and then really makes me feel a lot better and improves my mood and how we enjoy our home too. At the weekend we had some help doing this from a cleaner who made much more light work of our kitchen and bathroom than I ever would - and the Unilever products including Domestos were put to great use. Four days on, and we are doing our best to keep on top of things; and it's good to know that everything is clean and we have a safe and tidy home environment. * On the flip side of this, I am also aware that my need for being clean and tidy at all times can actually stop Ethan from having fun and learning - after all, Persil say that 'dirt is good', so I am trying to worry less about mess. It can always be cleaned up later. * For the past couple of Christmases, I have taken part in a charity donation initiative called Project Shoebox and last year, I actually became a local ambassador. It was a real eye opener for me and was something that, despite being a small gesture, actually made a real difference and hopefully showed people in difficult scenarios that there is a brighter future ahead. Sometimes, the world is a dark, confusing and scary place. Most of us are fortunate to not have to experience the cold, frightening realities that some have to but when something happens on a large scale or close to home, it's hard not to have such awful things play on your mind. But through small acts of kindness, I've been reminded of just how wonderful human beings can be too. Of what we are capable of, when someone is in need and we have the means, however small or simple, to make a difference. I have been an ambassador for Project Shoebox, a once local drive to help women (and often their children) in domestic violence refuges, now a national network of volunteers offering to collect for a refuge near where they live. I'd donated for two years but wanted to do more. And with the help of friends, family, colleagues and complete strangers, I managed to do that. Last December, I had enough items collected to make up 40 shoeboxes. They went to 40 women and children, to give them some essentials and to show them that someone cares. And I had plenty left over to make more. I was taken aback again by the generosity of spirit of people I know and people I have only just met. So many items had been bought especially, collated into big bags and boxes, every need thought of. I had steady visits at my door with deliveries of kindness and it made me realise something. I spent whole weekends boxing up donations and delivered 82 complete care packages to a refuge not 12 minutes away from where I live. Being kind and doing small things to show others we care is a wonderful thing that makes everyone feel good. And this feeling gets passed on. And on. 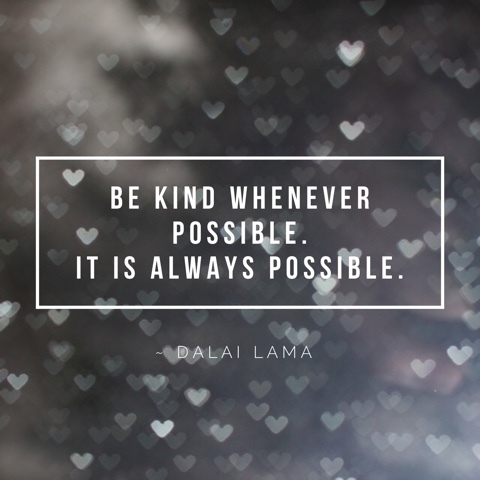 One person making an act of kindness leads to another and another. There's good people out there, living next door, leading normal lives. But making a difference. The gestures people made to help me help women in refuges last Christmas on behalf of Project Shoebox, created by the kind and thoughtful Kate Kenyon, really touched me and shown me something about the season of giving and what it is to be human. I remember seeing a poster saying something like 'It's called humankind for a reason' and now I know this to be true. 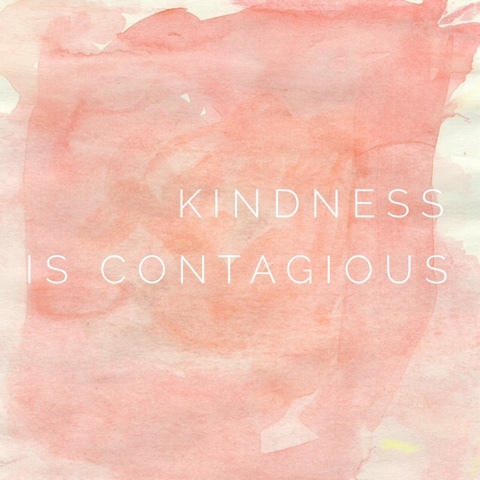 Kindness is contagious. Go pass it on. Six out of ten parents saying that they have started to live in a ‘greener’ way at home at the suggestion of their children. 83% of children continue to feel optimistic about their own future and 59% feel optimistic about the future of the environment. Most parents (between 70-80%) believe that, compared with themselves, their children will live longer, have a better education and better job prospects, and will enjoy life more, even if they will have to work harder to reap the rewards of the greater benefits ahead.